Every year, your gutters help drain water away from your home, but they also collect dirt and debris. It’s often difficult to see just how much stuff is up there, which is why you need to have your gutters professionally cleaned on a regular basis. Doing so can protect you and your home from costly damages related to unkempt gutters. We are a fully insured cleaning company with over a decade of gutter cleaning experience. Our gutter cleaning service is for everything gutter-related, including eavestroughs, soffits, downspouts and fascias. The eavestroughs on your home keep water flowing to the right places. When blockages and clogs occur, the water will instead flow elsewhere, leading to expensive water damage. Water damage from unclean gutters can include roof repairs, driveway replacements, and even expensive foundation repairs. We seek to make gutter cleaning easy and affordable. We can even set you up on a regular gutter cleaning schedule so you don’t have to worry about dirty eavestroughs or remembering to call for your next appointment. Gutter sealant services: Using a high quality sealant, we can patch up your gutters to make them watertight for years to come. Eavestrough flushes: This is a form of gutter inspection that helps us learn where leaks are happening. If we find a problem, we can seal or replace the gutter and help your whole system work better. Downspout guard installation: This one-time service helps direct water into your downspouts for more effective drainage. We believe professional and quality work is the cornerstone of any business, and this is especially true with gutter cleaning. Every staff member at NICK’S Window Cleaning is dedicated to providing top-of-the-line service, which includes comprehensive gutter cleaning, including eavestroughs, gutters, fascias, and soffits. We’ll even clean everything by hand to make sure the job is done right. We’re also available for post-construction gutter cleaning. Since gutters can get especially dirty during construction, we’ll often use a specialty liquid cleaner that’s tough on even the most stubborn stains. After this cleaning, your gutters will be show-ready and working at their absolute best. 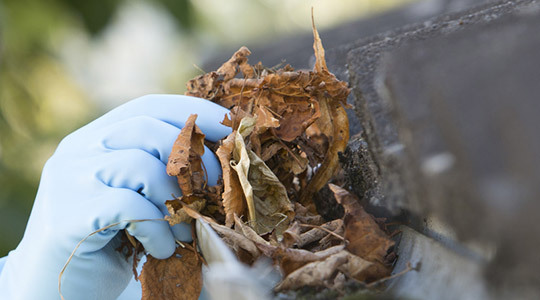 The best defence against unclean gutters is a professional cleaning every spring and fall. Without it, there are plenty of costly damages that can occur. The first major type of damage comes during heavy rainfall. Water that overflows instead of running down the gutters can fall onto personal property or seep into unexpected places, leading to flooding and expensive water damage. Standing water inside the eavestroughs is also a problem and can lead to roof repairs while adding unnecessary strain to the eavestroughs and gutters. The second major type of damage comes during winter, when the standing water freezes and expands. This causes warping in the gutters and, in some cases, they can end up falling off of your house entirely. This is an expensive fix but can also lead to personal injury. NICK’S Window Cleaning provides full commerical & residential eavestrough cleaning services to the entire Markham region, up to our maximum 3 storey working height. Our workers are highly-trained, insured, and very professional. Our job is to make sure your gutters and eavestrough are completely clean so that they function at their best and also look fantastic. Our highest-priority is your satisfaction with our services, so we take pride in delivering unparallaled customer service. Contact NICK’S Window Cleaning today for your Markham gutter or eavestrough cleaning and experience why more people are selecting our company. Professionals have the right equipment to safely clean out eavestroughs. Even if your eavestroughs are clogged with leaves, sticks, and other debris a professional cleaner will be able to quickly and safely clean them out. Instead of sticking your hands into dirty and wet eavestroughs to try and scoop them out let a technician with the right equipment and experience get your eavestroughs clean and get rid of all that nasty debris. Mold is something that can be really dangerous. Standing water in eavestroughs or clogged downspouts can lead to mold growth. Mold is dangerous to breathe and very dangerous if it gets into your home. Regularly having a professional who is trained in mold elimination clean out the eavestroughs on your home will protect you and your family from exposure to toxic mold. Getting your eavestroughs cleaned by a professional is a great way to prevent the growth of toxic mold that could make you and your family sick. Clogs in your eavestroughs and downspouts can wreck the foundation of your home if you’re not careful. During the rainy season and in the winter water can back up in your downspouts and spill out from your eavestroughs. That water will soak into the foundation of your home and can cause cracks and other damage. Foundation damage can be very expensive to fix and eventually if left unfixed it can cause structural damage to your home. That’s why you should have your eavestroughs and downspouts cleaned out at least twice a year. If you live in an area where there are a lot of trees you should have them cleaned three times a year to make sure they are not filled with leaves and causing water to back up.